On 30th, September Hyderabad Metro Rail Limited Managing Director, NVS Reddy along with the engineers of L&TMRHL inspected the works from Cyber Towers to Raheja Mindspace Junction. 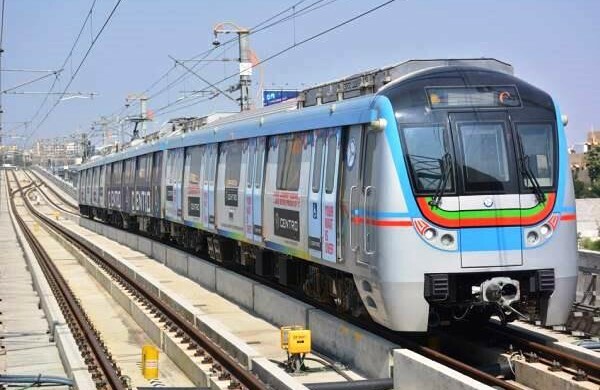 Hyderabad: Hyderabad Metro Rail Limited (HMRL) is changing the location of four pillars on the route in order to ensure sufficient carriageway for traffic movement and also to avoid Metro pillars in the middle of the road between Cyber Towers and Shilparamam flyover. According to the original plan, the pillars were to be constructed in the middle of the road, which would permanently reduce space on the already narrow carriageway between Cyber Towers and Shilparamam flyover. Now the pillars are being shifted adjacent to the flyover and they are being accommodated in the central median of the flyover. To this effect, the ramp portion of the flyover is being widened through an engineering solution of strengthening and rebuilding the sidewalls of the ramp of the flyover. The engineers were instructed to take up several activities in parallel mode in order to expedite the construction of 22 Metro pillars and viaduct beyond Hitec city station to Hotel Trident for the creation of train reversal facility. Beyond the Hitec city station to Trident Hotel, for the creation of train reversal facility, all measures will be taken to reduce the duration of each activity on the viaduct on the crucial 650-meter length. Now on the temporary basis Temporary, the partial closure of the road from Cyber Tower junction to Cyber Gateway junction is being planned. And apart from this, the discussions are on for partial road closure and traffic diversion measures with Cyberabad traffic police. Apart from this, there are also plans are onto make Cyber Towers flyover as a temporary one-way flyover towards Cyber Gateway and diverting the traffic through Deloitte crossroads – Oracle Junction – Google crossroads – Hitex – Shilparamam – Hitec city Junction, etc. To immediately strengthen all the alternative roads to facilitate traffic diversion, directed to the HMRL and L&TMRHL engineers. This will highly aid in taking up Metro Rail works round the clock in order to meet the target set by the Governor ESL Narasimhan to launch Metro services on Ameerpet-Hitech city route by December.